Weak Economy Means an Inferior Culture? Do poor American states have ‘inferior cultures’? In a nut-shell, Mitt Romney insinuated on his recent visit to Jerusalem that Israel’s economy performs well because Israeli society has a superior culture. Inevitably, Romney also hinted that the Palestinian economy does not perform well because Palestinian society lacks ‘freedom’ and ‘democracy’, thus making Palestinian culture ‘inferior’. Romney’s ‘logic’, therefore, suggests that a strong economy means you have a superior culture; similarly, a weak economy means you have an inferior culture. 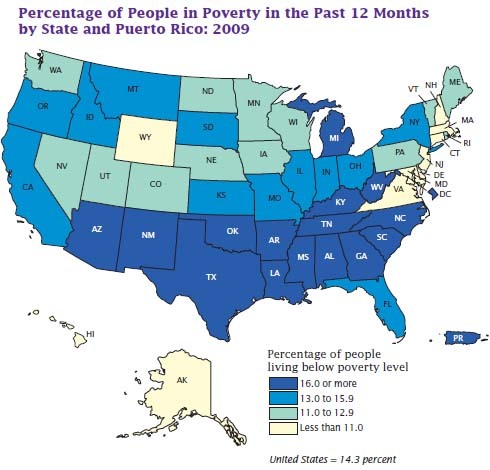 So what happens when we apply Romney’s ‘weak economy = inferior culture’ theory to American states? How does it hold up? Do these states have weak economies because of their ‘inferior cultures’? Certainly Romney would never suggest such a thing, which makes his theory completely and utterly inadequate due to its inherent bias. There is, however, the chance that he does believe his theory applies; that these states do have weak economies because of their ‘inferior culture’. If that is the case, Romney is lying to his fellow Americans. The man is certainly no theoretician.